SAN CARLOS, Calif., July 24, 2015 /PRNewswire-USNewswire/ -- The Bonnie J. Addario Lung Cancer Foundation (ALCF) will honor Fred R. Hirsch, M.D., Ph.D., with the 2015 Addario Lectureship Award for his continued leadership and expertise in lung cancer treatment and research. Dr. Hirsch, CEO of the International Association for the Study of Lung Cancer (ISLAC), will receive the award at the 16th International Lung Cancer Congress held on July 30 – August 1 in Huntington Beach, California. "Dr. Hirsch's contribution and dedication to lung cancer research is truly remarkable," said Bonnie J. Addario, 10-year lung cancer survivor and founder of the ALCF. "Dr. Hirsch is a cancer survivor which makes him very sensitive to patients and increases his commitment to their survival. We are thrilled to present him with the eighth Addario Lectureship Award to highlight his commitment to eliminate lung cancer worldwide. " Known best for his unsurpassed research on the diagnostic tool, fluorescent in situ hybridization (FISH), colleagues David Gandara M.D., Associate Director, Clinical Research at the UC Davis Cancer Center and Roy Herbst, Ensign Professor of Medicine and Chief of Medical Oncology at the Yale Cancer Center have nicknamed him the "Big Fisherman." Dr. Hirsch has been a professor of medicine at the University of Colorado Cancer Center and professor of medicine and pathology at the University of Colorado, Denver since 1999. He also serves as the conference president for the World Conference on Lung Cancer. Dr. Hirsch received his MD and PhD from the University of Copenhagen, Denmark and served as chief physician at the department on oncology at the Finsen Center in Copenhagen from 1996 to 1999. He has been a supervisor for many European and Asian post-doctoral trainees in his lab at the University of Colorado Cancer Center. "There is no one in the entire world that has been more dedicated to IASLC and addressing lung cancer worldwide," said Paul Bunn, Jr., MD, distinguished professor, division of medical oncology at the University of Colorado and James Dudley chair in lung cancer research. "Fred has a unique perspective – he is not only both a pathologist and a medical oncologist but also has trained and practiced in both Europe and the U.S. He has been involved in studies of lung cancer diagnosis, staging, prevention, early detection and treatment that have revolutionized the care of lung cancer patients. He works diligently to bridge international ties for lung cancer and recognizes it is a global disease that requires a global effort." Dr. Hirsch received the Mary J. Matthews Distinguished Scientific Award from ISLAC, the Japanese Lung Cancer Society Merit Award, the British Medical Association Medical Book Award, The Annals of Oncology Award, the Lise and Gunnar Waerums Foundation Award, the Fru Agnes Andressons Memory Award and the Lung Cancer Foundation of America Young Investigator Award, among many others. He has authored hundreds of peer-reviewed papers and has current funding for his work on Squamous Cell lung cancer from ISLAC. "Dr. Hirsch is working diligently to bridge international ties for lung cancer, sparking a global effort to address a global disease," said Addario. "We are honored to recognize him as a scientist, a physician and a friend." The ALCF has supported the Lung Cancer Congress for the past eight years and serves as a co-sponsor along with the IASLC. The annual three-day event provides physicians with practical information about the clinical implications of lung cancer screening, the latest clinical data impacting the treatment of lung cancer and novel agents and strategies that are changing the future of lung cancer therapy. The Bonnie J. Addario Lung Cancer Foundation (ALCF) is one of the largest international philanthropies (patient-founded, patient-focused and patient-driven) devoted exclusively to eradicating lung cancer through research, early detection, education and treatment. The Foundation's goal is to work with a diverse group of physicians, organizations, industry partners, individuals, patients, survivors and their families to identify solutions and make timely and meaningful change and turn lung cancer into a chronically managed disease by 2023. The ALCF was established on March 1, 2006, as a 501c(3) non-profit organization and has raised nearly $25 million for lung cancer research and related programs. 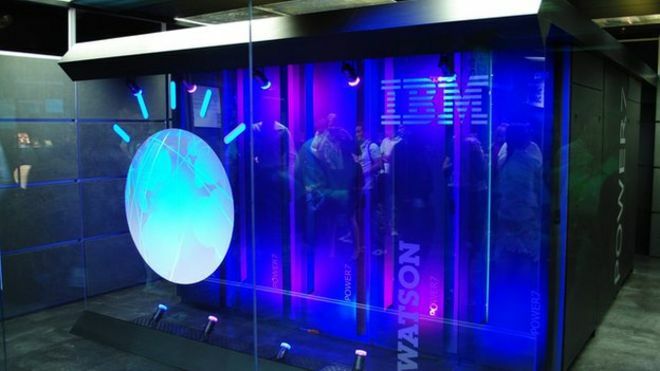 IBM's Watson supercomputer to speed up cancer care. Originally published by the BBC on 6 May 2015. IBM's supercomputer Watson will be used to make decisions about cancer care in 14 hospitals in the US and Canada, it has been announced. Using computers to trawl through vast amounts of medical data speeds up the diagnosis process. The system will help assess individual tumours and suggest which drug should be used to target them. Doctors have welcomed the new computer which will learn from each case it examines. "When you are dealing with cancer, it is always a race," said Dr Lukas Wartman, assistant director of cancer genomics at the McDonnell Genome Institute at Washington University in St. Louis, one of those signed up to use the Watson system. "As a cancer patient myself, I know how important genomic information can be. "Unfortunately, translating cancer-sequencing results into potential treatment options often takes weeks with a team of experts to study just one patient's tumour and provide results to guide treatment decisions. Watson appears to help dramatically reduce that timeline," he explained. Most people currently diagnosed with cancer will receive surgery, chemotherapy or radiation treatment. But as genetic sequencing becomes increasingly accessible and affordable, some patients are starting to benefit from treatments that target their specific cancer-causing genetic mutations. However the process is very time-consuming - a single patient's genome represents more than 100 gigabytes of data - and this needs to be combined with other medical records, journal studies and information about clinical trials. What would take a clinician weeks to analyse can be completed by Watson in only a few minutes. "The technology that we're applying to this challenge brings the power of cognitive computing to bear on one of the most urgent and pressing issues of our time - the fight against cancer - in a way that has never before been possible," explained Steve Harvey, vice president of IBM Watson Health. According to Mr Harvey, Watson "will look for actionable targets", although he acknowledged that, "when institutions do genetic sequencing, only about half the cases come back with something actionable". Sometimes it is impossible to identify the main mutation and, in other cases, no targeted therapy currently exists. Those collaborating with IBM include the Cleveland Clinic, the Fred & Pamela Buffett Cancer Centre in Omaha and the Yale Cancer Centre. Eleven others will join the programme by the end of 2015 and each will pay an undisclosed subscription fee to IBM. The link-up is part of an increasingly close relationship between the medical community and technology corporations. It also recently teamed up with IBM to allow the software that helps gather health data from iPhones to be used by Watson. IBM is convinced that Watson can "help change the face of healthcare" but it has even bigger ambitions for its cognitive computing platform. Speaking at an IBM event this week, the firm's chief executive Ginni Rometty made a bold prediction for the technology, saying: "in the future, every decision mankind makes, every decision, is going to be informed by a cognitive system like Watson and, as a result, our lives in this world are going to be better for it." Full Disclosure: Joe Gaeta, President and CEO of The Joan Gaeta Lung Cancer Fund is also an employee of the IBM Corporation. San Carlos, Calif. (July 23, 2014) – The Addario Lung Cancer Medical Institute (ALCMI) today launched a new study, the Genomics of Young Lung Cancer, to understand why lung cancer occurs in young adults, who quite often are athletic, never smokers and do not exhibit any of the known lung cancer genetic mutations. ALCMI, a patient-centric, international research consortium and partner of the Bonnie J. Addario Lung Cancer Foundation (ALCF), is facilitating this first-of-its-kind, multi- institutional, prospective genomic study in order to identify new genome-defined subtypes of lung cancer and accelerate delivery of more effective targeted therapies. Our evolving understanding of the disease and new molecular tools suggest that young age may be an under-appreciated clinical marker of new genetic subtypes. An important goal for this research study is to reveal new lung cancer sub-types of lung cancer requiring distinct treatment strategies. “Leveraging this study as a proof of principle, ALCMI is also characterizing other specific patient populations to support emerging data that lung cancer diagnostic and therapeutic interventions are more effective when individualized, and personalized approaches are brought to bear," Steven Young, President and COO of ALCMI, who also points out this study represents a unique public-private collaboration between the ALCMI consortium and Foundation Medicine, Inc. The Genomics of Young Lung Cancer study is centrally managed by ALCMI while the Principal Investigator (study leader) is Barbara Gitlitz, MD, Associate Professor of Medicine, University of Southern California, Norris Comprehensive Cancer Center. "This study lays the groundwork for discovery of novel targetable genotypes as well as heritable and environmental risk factors for lung cancer patients under 40,” Dr. Gitlitz said. "We'll be evaluating 60 patients in this initial study and hope to apply our findings to a larger follow-up study in the future." Other investigators include Geoffrey Oxnard, MD, (Dana-Farber Cancer Institute), David Carbone, MD, PhD (The Ohio State University), and Giorgio Scagliotti, MD, PhD and Silvia Novello, MD (both at the University of Torino in Italy). Patients may enroll in the study regardless of where they live, and will not need to travel to any of the above institutions. For more information about the study, please contact Steven Young, president of ALCMI, at (203) 226-5765 or info@lungcancerfoundation.org. Lung cancer patients living in the United States will not need to travel to any of the above institutions to participate (but may do so), and may learn more at https://www.openmednet.org/site/alcmi-goyl. Individuals living outside the U.S. may contact ALCMI at info@lungcancerfoundation.org for information on how to participate. In 2014 alone, more than 224,000 new cases of lung cancer will be diagnosed in the U.S., and the American Cancer Society estimates nearly 160,000 Americans will die of the disease. The ACS estimates there are 400,000 people in the U.S. living with lung cancer, and about 8,000 of those are under age 45. Nearly 4,500 people under 45 will be diagnosed with lung cancer in 2014. Nearly 80 percent of new lung cancer patients are former or never-smokers. Lung cancer takes more lives than breast, prostate and colon cancers combined and it accounts for 27 percent of all cancer deaths. It is the second leading cause of all deaths in the U.S. Lung cancer is the leading cancer killer in every ethnic group and since 1987 has killed more women every year than breast cancer. The five-year survival rate for lung cancer has changed little in more than 40 years – from 12 percent in 1970 to 16 percent today. The Bonnie J. Addario Lung Cancer Foundation is one of the largest philanthropies (patient-founded, patient-focused, and patient-driven) devoted exclusively to eradicating Lung Cancer through research, education, early detection, genetic testing, drug discovery and patient-focused outcomes. The Foundation works with a diverse group of physicians, patients, organizations, industry partners, individuals, survivors, and their families to identify solutions and make timely and meaningful change. ALCF was established on March 1, 2006 as a 501c(3) non-profit organization and has raised more than $15 million for lung cancer research. To learn more, please visit www.lungcancerfoundation.org. Originally published on June 24th, 2014 by Victoria Colliver at SFGate.com. Victoria is a San Francisco Chronicle staff writer. Natalie DiMarco's only obvious risk factor for getting lung cancer was having lungs. Natalie DiMarcoDiMarco had been experiencing respiratory problems for months in 2010, but her doctors just assumed the mother of two had allergies. By the time she learned she had lung cancer, the disease had spread into her lymph nodes and reached the membranes that surround the lungs. "I'm young, didn't have any history of smoking, and that's why a doctor didn't X-ray me from the beginning," said DiMarco, now 36, who lives in Penngrove with her husband, daughters, ages 5 and 6, and a teenage stepson. An estimated 4,600 to 6,900 people under 40 in the U.S. are diagnosed every year with lung cancer that has no apparent cause. The disease appears to be quite different from the lung cancer found in longtime smokers and, aside from initial research that indicates that young patients, like DiMarco, tend to share certain genetic changes, the source remains a mystery. A new study just getting under way hopes to find out more about these patients, what they have in common and, potentially, why they get lung cancer. If researchers can find a common thread, or several, it could lead to more effective treatment or point the way to new targeted therapies. The $300,000 Genomics of Young Lung Cancer Study is small - just 60 patients - but the lead researchers hope it will help find the answers they're looking for and even help others with lung cancer, particularly the 15 percent of the nearly 230,000 Americans diagnosed with lung cancer each year who have never smoked. Addario Lung Cancer Medical Institute, a partner organization of theBonnie J. Addario Lung Cancer Foundation in San Carlos, initiated and is paying for the study along with Genentech. Bonnie Addario, who was diagnosed with lung cancer in her mid-50s in 2003 and founded the organizations that bear her name, said much is unknown about this population of patients because it's never been systematically studied. "We're hoping to find something that may be in another cancer or another disease that could be part of their therapy," she said. Dr. Barbara Gitlitz, a lead researcher of the study and director of the lung, head and neck program at theUniversity of Southern California's Norris Comprehensive Cancer Center, said the disease should be thought about as its own entity. "We may discover that by looking at the genomics of these people, we may find driver mutations. We'll see patterns that might be specific to this population and we might see something new," she said. Time is of the essence, considering how devastating a lung cancer diagnosis is. Bonnie AddarioJust 15 percent of people diagnosed with lung cancer live longer than five years, in part because the disease is difficult to detect in its earlier stages and tends to be caught too late. That's particularly true among young people because no one's looking for it. "What we're hearing quite often is that they're athletes and they're very fit - the people you would least expect to have cancer, let alone lung cancer," Addario said. She added that the disease appears to be more common in young, nonsmoking women than in their male counterparts. Jill CostelloThe study was inspired by Jill Costello, a San Francisco native and varsity coxswain for UC Berkeley's women's crew, who died of lung cancer in 2010 at age 22, a year after she was diagnosed. Jill's Legacy, a subsidiary of Addario's foundation, was created in her honor to raise funds and awareness for lung cancer among young people. Researchers do know that young people and nonsmokers with non-small-cell lung cancer - the most common kind - typically have alterations in their genes that can affect how the disease is treated. The genetic mutation found most often - EGRF, for epidermal growth factor receptor - occurs in about 10 to 15 percent of non-small-cell lung cancer patients. But a host of other known mutations - ALK, ROS1, BRAF, HER2, MET, RET - have also been identified as contributing to lung cancer in young patients, said Dr. Geoffrey Oxnard, a lung cancer specialist at the Dana-Farber Cancer Institute in Boston, also a lead researcher of the study. Drugs have been developed in recent years to "target" those mutations, or go after those specific cells to thwart their growth. The first EGRF therapies, AstraZeneca's Iressa, or gefitinib, was approved by federal regulators in 2003 followed by Roche's Tarceva, or erlotinib, in 2005. But even these relatively new treatments don't cure the disease; at most they buy time - from several months to five years - before the cancer returns. Oxnard said he hopes the study - which will test for more than 200 mutations - will not only show a pattern of these genetic alterations but also spotlight the necessity for young and nonsmoking people to get genetically tested after diagnosis, which is not routinely done in all centers. "We know comprehensive genetic testing has the potential to make a difference in any cancer patient, but we think in these patients, it's really going to be transformative," Oxnard said. DiMarco, who hopes to participate in the study, said she learned her genetic subtype by seeking out specialists around the country. Almost by chance her biopsy was tested by a Boston surgeon for the ROS1 alteration, which in 2010 was just newly identified. The mutation makes DiMarco a candidate for a drug called crizotinib, sold under Pfizer's brand name Xalkori. DiMarco, who has undergone numerous rounds of chemotherapy and radiation, has not yet resorted to Xalkori because she and her doctors want to keep that in the arsenal to use only if and when it becomes necessary. So far her disease has been kept in check, and she's been off chemotherapy for 17 months while undergoing regular scanning. Lisa GoldmanAnother young patient, Lisa Goldman, a mother of two who lives in Mountain View, was diagnosed with lung cancer in January at age 40. The disease was found in both lungs and considered stage four. Like DiMarco, Goldman has tested positive for the ROS1 mutation and has also chosen to hold off on Xalkori after receiving other therapies in combination with traditional chemotherapies. "I have that in my back pocket to use next," she said, referring to thePfizer drug. Goldman, who may not be eligible for the study now that she's 41, said the stigma of lung cancer because of its connection to smoking causes her to hesitate about naming her disease and then assert she's never smoked. But she speaks out about having lung cancer because she says she has to. "People need to know this happens. I'm not a fan of smoking, but nobody deserves to get cancer," she said. "Smoking is a contributor to breast cancer and heart disease and other disease, but people don't ask you if you caused this yourself." Goldman's latest scan showed her tumors had shrunk or remained stable, with the exception of one tiny new spot. But she tries to retain a sense of normalcy, particularly for her kids, ages 8 and 11. "How do you live with something like this hanging over your head?" she said. "You just can't live like every day is your last." DiMarco manages by incorporating Chinese medicine - acupuncture, massage, cupping therapy - into her life. As far as her young children know, their mom has some "bad cells in her body" that "made a spot in her lung" and that she has to take medications to get rid of it. While DiMarco knows she's been dealt a difficult hand, she tries to live in the present but look to the future about the potential treatment options. "It's all about what card you play that buys you the most time," DiMarco said. "If I understand what to do now ... I can sleep easier and not have to worry. But I need to have a plan. I need to know, what do we do next?" Every year, more than 228,000 people are diagnosed with lung cancer in the U.S. and about 160,000 will die of the disease. An estimated 7,000 to 9,000 people under age 40 are living with lung cancer. The average age at diagnosis is 70. Lung cancer takes more lives than any other cancer. It accounts for 27 percent of all cancer deaths - more than breast, prostate and colon cancers combined. Funding for lung cancer lags behind other cancers, especially considering the impact of the disease. The federal government spent $315 million on lung cancer research in 2012 compared with $603 million for breast cancer. Most people diagnosed with lung cancer are former smokers or people who've never smoked - about 15 percent have never smoked and more than 50 percent have smoked in the past but quit. A bold new way to test cancer drugs started Monday in hundreds of hospitals around the U.S. In a medical version of speed dating, doctors will sort through multiple experimental drugs and match patients to the one most likely to succeed based on each person's unique tumor gene profile. It's a first-of-a-kind experiment that brings together five drug companies, the government, private foundations and advocacy groups. The idea came from the federal Food and Drug Administration, which has agreed to consider approving new medicines based on results from the study. Its goal is to speed new treatments to market and give seriously ill patients more chances to find something that will help. Instead of being tested for individual genes and trying to qualify for separate clinical trials testing single drugs, patients can enroll in this umbrella study, get full gene testing and have access to many options at once. The study, called Lung-MAP, is for advanced cases of a common, hard-to-treat form of lung cancer — squamous cell. Plans for similar studies for breast and colon cancer are in the works. "For patients, it gives them their best chance for treatment of a deadly disease," because everyone gets some type of therapy, said Ellen Sigal, chairwoman and founder of Friends of Cancer Research, a Washington-based research and advocacy group that helped plan and launch the study. "There's something for everyone, and we'll get answers faster" on whether experimental drugs work, she said. Cancer medicines increasingly target specific gene mutations that are carried by smaller groups of patients. 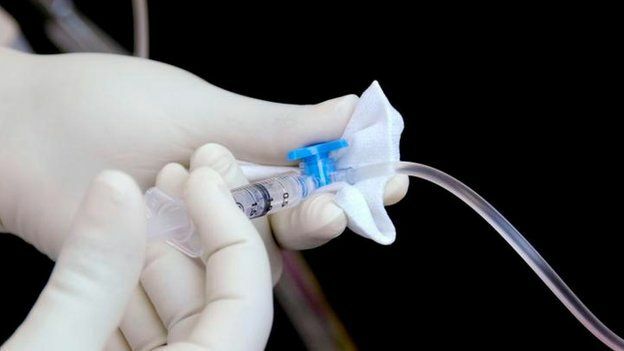 But researchers sometimes have to screen hundreds of patients to find a few with the right mutation, making drug development inefficient, expensive and slow. One of the leaders of the Lung-MAP study — Dr. Roy Herbst, chief of medical oncology at the Yale Cancer Center — said he once screened 100 patients to find five that might be eligible for a study, and ultimately was able to enroll two. "It's just going to be impossible, in rare subgroups, for companies to find enough" people to try out a new medicine, said Dr. Richard Pazdur, cancer drugs chief at the FDA. He and others at the FDA suggested the Lung-MAP trial design to speed new treatments to market and "minimize the number of patients exposed to ineffective therapies," he said. Everyone in the study will be screened for mutations in more than 200 cancer-related genes, rather than a single mutation as in conventional studies. Then they will be assigned to one of five groups based on what these tumor biomarkers show. Each group will test a particular experimental medicine. Drugs can be added or subtracted from the study as it goes on, based on how each performs. The initial round of testing involves Amgen, Genentech, Pfizer, AstraZeneca PLC, and AstraZeneca's global biologics partner, MedImmune. Up to 1,000 patients a year can be enrolled in the study. It will cost about $150 million. The National Cancer Institute is paying $25 million, and the rest will come from foundations, charities and others in the public-private partnership. About 500 hospitals that are part of a large cancer treatment consortium around the country will take part, and some private groups want to join as well, Herbst said. "Nothing like this has ever been done before," where such comprehensive testing will be done to match patients to experimental drugs, he said. Breyan Harris, a 33-year-old nurse from Sacramento, hopes to enroll. She's a lifelong non-smoker who was diagnosed with lung cancer on June 3. "Since then I've pretty much been on the phone, seeing doctors, trying to figure out how do I get rid of this," she said. Harris expects to have one lung with a large tumor removed, "but if it comes back in my other lung I'm in real trouble," so finding a drug to attack any remaining, hidden cancer is crucial, she said. Amanda Chen is a health researcher at Self Care Catalysts, a health research company based in Toronto and San Francisco. She is conducting a self-funded, proprietary research on the Cancer Patient Journey. She is looking for patients to participate in a 30-minute online survey. This survey will explore the journey of cancer patients as they cope with their illness, their treatment experience, decision making process, the role of their caregivers and supporters, and more. The insights drawn from this survey will be used to develop health solutions and programs that better meet patients’ needs. All participants will be compensated for their time. You can download the .PDF file below to learn more. You can also contact Amanda directly at amanda@selfcarecatalysts.com. SAN CARLOS, CALIF. — The Bonnie J Addario Lung Cancer Foundation (ALCF), in collaboration with the Van Auken Private Foundation today announced the 2014 Young Innovators Team Award (YITA), a first-of-its-kind program that will fund and support teams of young investigators to conduct novel, innovative and transdisciplinary research with a potential of high clinical impact for lung cancer patients. “In an effort to involve all stakeholders in our mission of making lung cancer a chronically managed disease by 2023, our goal with this program is to identify young, brilliant and collaborative out-of-the-box thinkers to deliver meaningful and measurable results in the field of lung cancer,” said Bonnie J. Addario, lung cancer survivor and founder of the ALCF. The 2014 Young Innovator Team Award, with funding from both the Addario Lung Cancer Foundation and the Van Auken Private Foundation, will provide up to a total of $500,000 per team over a duration of 2-3 years, to teams of two or more young investigators – those within five years of their first faculty appointment (www.lungcancerfoundation.org/grants). Out-of-the-box – High-risk, high-impact research that will typically not be selected for federal funding, is creative and has potential for near-term benefit to lung cancer patients. Collaborative – Research that fosters collaboration among young researchers who haven’t worked together in the past, preferably across-institutions. Translational – Research with outcomes that can be quickly moved from the lab to the clinic, or from the bench to bedside. Multi-Disciplinary – Projects that involve multiple academic disciplines/specializations in their approach to solve a problem in the field of lung cancer. The funding mechanism is designed in such a way that young investigators work together in cross-disciplinary teams and drive the projects, with guidance from mentors at their own institution, as well as the 2014 YITA Scientific Review Committee that will guide and steer their progress, and make final decisions on continued funding. “The idea is to encourage new thinking and foster leadership skills among young innovators, instilling confidence in them to drive breakthrough, transdisciplinary science under a collaborative, cross-institutional paradigm,” said David Carbone, M.D., Ph.D. at The Ohio State University, and one of the ALCF Scientific Review Committee members. The 2014 YITA Scientific Review Committee is comprised of four top global experts in the lung cancer field: David Carbone, M.D., Ph.D (The Ohio State University), David Gandara, M.D. (University of California, Davis), Roy Herbst, M.D., Ph.D (Yale School of Medicine), Giorgio Scagliotti, M.D., Ph.D. (University of Torino). Studies of mechanisms of lung cancer initiation, progression and metastases. Development of new technologies for the detection, treatment and prevention of lung cancer. Diagnostic and therapeutic interventions, preferably new diagnostics and treatments for metastatic lung cancer especially those targeting currently ‘undruggable’ mutations against which there is no available targeted therapy. Early detection of lung cancer, especially via non-invasive tools. Identification of mechanisms of resistance to current lung cancer modalities. Translational research in metabolism and nutrition. For more information on the award, guidelines for submission, FAQs and the online submission portal please visit www.lungcancerfoundation.org/grants. The Bonnie J. Addario Lung Cancer Foundation will accept online applications during June 3-August 1, 2014. Funding for this unique new award is provided by the Bonnie J. Addario Lung Cancer Foundation and the Van Auken Private Foundation. The Bonnie J. Addario Lung Cancer Foundation is one of the largest philanthropies (patient-founded, patient-focused, and patient-driven) devoted exclusively to eradicating Lung Cancer through research, education, early detection, genetic testing, drug discovery and patient-focused outcomes. The Foundation’s commitment to lung cancer patients is to collaborate and partner with the leaders in oncology, technology, science, medicine and philanthropy to make Lung Cancer a chronically managed disease by 2023. The Foundation works with a diverse group of physicians, organizations, industry partners, individuals, survivors, and their families to identify solutions and make timely and meaningful change. ALCF was established on March 1, 2006 as a 501c(3) non-profit organization and has raised more than $10 million for lung cancer research. To learn more, please visit www.lungcancerfoundation.org. The Van Auken Private Foundation was established on April 17, 2008 as a 501(c)(3) non-profit organization. Its purpose is to make contributions, grants and provide assistance to other tax-exempt charitable organizations, in arts, science, medicine, education and worthy social causes.